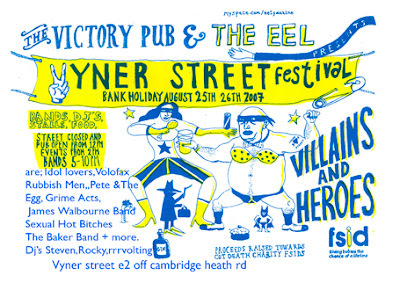 A rather belated little bird informs me it's Vyner Street Festival this weekend and a rather larger bird tells me I'll be there on Sunday with Scrumptious along with various prints/badges/cards and other such delightful items. If anyone is likely to be around East London on Sunday and would like to purchase a print of their face then let me know today or tomorrow and I'll see what I can do. This blog has not been set up to portray a balanced picture of all of the beautiful inhabitants of this planet. I have been drawing portraits of people who take the time to send me a photograph of themselves and have, with a few exceptions, been working through them in the order that they arrive in my inbox. Your observation about the relative lack of diversity in the people who have sent in photographs so far is a valid if rather redundant one. Your suggestion that I am for some reason filtering out all the non Caucasian faces is something that I find pretty hurtful. Last chance to vote for your favourite t-shirt design. I have had some new birthday cards printed. 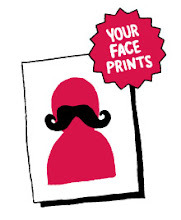 You may or may not be intersted that the image is the very first face drawn for this project. If anyone would like to purchase a card(s) then send me an email. Alicia's either got her hooves on a very special keyboard enabling her to email me or this isn't really her face. Visit Very Studio's shop where there are new t-shirt designs to vote for - including a few with my own scribbles adorning them.